[6:09:31 PM] Thuan Thi Do: The Monad knows from the first what is his object ( Page 293 ) in evolution, and he grasps the general trend of it. But, until that portion of him, which expresses itself in the ego, has reached a fairly high stage, he is scarcely conscious of the details down here, or at any rate he takes little interest in them. He seems at that stage not to know other Monads, but rests in indescribable bliss, without any active consciousness of his surroundings. The purpose, then, of the descent of the Monad into matter, is that through his descent he may obtain definiteness and accuracy in material detail. To this end, as we have seen in the earlierchapters of this book, an atom of each of the planes of Âtma, Buddhi and Manas is attached to the Monad : the distinction of these atoms gives a precision that did not exist in the consciousness, of the Monad on his own plane. But, it may be asked, if the Monad is of the essence of divinity in the beginning, and returns to divinity at the end of his long pilgrimage, if the Monad is all-wise and all-good, when he starts on his journey through matter, why is it necessary for him to go through all this evolution, including, as it does, much sorrow and suffering, simply to return to his source in the end? The question is based on a misconception of the facts. When that which we call the human Monad came forth from the Divine, it was not, in reality, a human Monad, still less an all-wise and all-good Monad: it returns, eventually, in the form of thousands of millions of mighty Adepts, each capable of himself, developing into a Logos. As a man who cannot swim, flung into deep water, at first is helpless, yet eventually learns to swim and move freely in the water, so is the Monad. At the end of his pilgrimage of immersion in matter, he will be free of the Solar System, able to function in any part of it, to create at will, to move at pleasure. Every power that he unfolds through denser matter, he retains for ever under all conditions: the implicit has become explicit, the potential the actual. It his own Will to ( Page 294 ) live in all spheres, and not in one only, that draws him into manifestation. For there was no developed individualisation in the Monad at first: it was simply a mass of monadic essence. The difference between its condition when issuing forth, and when returning, is exactly like that between a great mass of shining nebulous matter, and the solar system which eventually formed out of it. The nebula is beautiful, undoubtedly, but vague and, in a certain sense, useless. The sun formed from it by slow evolution pours forth life, heat and light upon many worlds and their inhabitants. Or we may take another analogy. The human body is composed of countless millions of tiny particles, and some of them are constantly being thrown off from it. Suppose that it were possible for each of these particles to go through some kind of evolution, by means of which it would in time become a human being, we would not say that, because it had been, in a certain sense, human at the beginning of that evolution, it had therefore not gained anything when it reached the end. So, the monadic essence comes forth as a mere outpouring of force, even though it be Divine force. The appearance and evolutionary course of the Monad may be compared with the appearance of the long day of Brahma, of the Saguna-Brahman Sachchidananda, the Divine Triplicity. That coming forth into cosmic manifestation we have reproduced, in our solar system, by the Solar Logos, and again by the Monad, who is a fragment of the Logos. When the human evolution, is over, he gathers himself up again, and the superhuman evolution begins. Thus we have the long swing of the opening life, from the nirvanic, back to the nirvanic, the whole of human evolution lying between these two. It is completed with the Initiation of the Jivanmukta, the Master, where superhuman evolution begins. Whilst the Monad in his own world is practically without limitations, at least so far as our solar system is concerned, ( Page 295 ) yet at every stage of his descent into matter he not only veils himself more and more deeply in illusion, but he actually loses his powers. 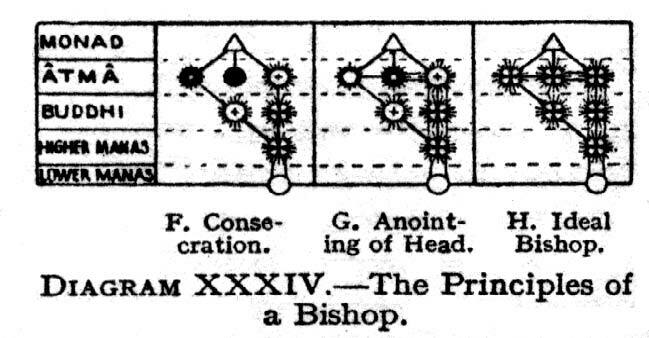 If, in the beginning of his evolution, we may suppose the Monad able to move and to see, in an infinite number of those directions in space which we call dimensions, than at each downward step he cuts off one of these, until, for the consciousness of the physical brain, only three of them are left. Thus, by involution into matter, the Monad is cut off from the knowledge of all but a minute part of the worlds which surround him. Furthermore, even what is left to him is but imperfectly seen. For those who can train themselves to appreciate more than three dimensions, there is available an excellent method of arriving at some sort of comprehension of what consciousness on planes higher than the physical is like, and what it involves : though at the same time such a method of approach brings home the hopelessness of expecting fully to understand the Monad, who is raised by many planes and dimensions above the point from which we are attempting to regard him. All the sacrifices and limitations, caused by descent into matter, may rightly be described as necessitating suffering. But as soon as the ego fully understands the situation, they are undertaken gladly : the ego has not the perfection of the Monad, and so he does not fully understand at first: he has to learn. Thus the quite tremendous limitation at each further descent into matter is an unavoidable fact, so that there is that much of suffering inseparable, from manifestation. We have to accept that limitation as a means to an end, as part of the Divine Scheme. There are two senses in which all manifested life is sorrowful, unless man knows how to live it. One of these is to a certain extent inevitable, but the other is an entire mistake, and is easily to be avoided. As we have seen, to the Monad, who is the true Spirit of man, all manifested life is a sorrow, just because it is a limitation: a limitation which we in our physical ( Page 296 ) brain cannot in the least conceive, because we have no idea of the glorious freedom of the higher life. It is in this sense that it has always been said that the Christ - the Second Person of the Trinity -offers Himself as a Sacrifice, when He descends into matter. Undoubtedly it is a sacrifice, because it is an inexpressibly great limitation, for it shuts off from Him all the glorious powers which are His, on His own level. The same is true of the Monad of man ; undoubtedly he makes a great sacrifice, when he brings himself in connection with lower matter, when he hovers over it through the long ages of its development up to the human level, when he puts down a tiny fragment of himself, a fingertip as it were, and thereby makes an ego, or individual soul. The second kind of sorrow, which it is possible entirely to avoid, is due to "desire", using that word in the wide sense to include all desires for lower things, such as craving for power, money, position, and so forth. All such desires necessarily cause disturbance and suffering: hence, from this point of view, what is most needed for progress is serenity. Hence we have the two first of the Four Noble Truths which the Lord Buddha taught : the Existence of Sorrow, and the Cause of Sorrow. Passing now to consider, more specifically, the ego in his relation to the Monad, we should realise that the individualising process, by means of which the ego comes into being, does not take place on the spiritual plane, but that Atma-Buddhi, as seen through Manas, appears to share in the individuality of Manas. Even the ego is not the true, eternal man : for the ego had a beginning—he came into existence at the moment of individualisation : and whatever has a beginning must also have an end. Therefore even the ego, which has lasted since emergence from the animal kingdom, is also impermanent. The Monad, and the Monad alone, is the only real, permanent man. We may look upon the ego as a manifestation of the Monad on the higher mental plane: but we ( Page 297 ) must understand that he is infinitely far from being a perfect manifestation. Each descent from plane to plane means much more than a mere veiling of the Spirit: it means also an actual diminution in the amount of Spirit expressed. Although to speak of Spirit in terms of quantity is inaccurate and misleading, yet, if an attempt is to be made to express these higher matters in human words at all, such incongruities cannot be wholly avoided. The nearest that we can come, in the physical brain, to a conception of what happens to the Monad, when he involves himself in matter, is to say that only part of him can be shown, and even that part must be shown in three separate aspects, instead of in the glorious totality which he really is in his own world. So, when the second aspect of the triple spirit comes down a stage, and manifests as buddhi or intuition, it is not the whole of that aspect which so manifests, but only a fraction of it. So again when the third aspect descends two planes, and manifests as intellect, it is only a fraction of a fraction of what the intellect aspect of the the Monad really is. Therefore the ego is not a veiled manifestation of the Monad, but a veiled representation of a minute fraction of the Monad. Following the ancient maxim, "as above, so below", as the ego is to the Monad, so is the personality to the ego. By the time we have reached the personality, the fractionisation has been carried so far that the part we are able to see bears no appreciable proportion to the reality of which, nevertheless, it is the only possible representation, to us. Yet with and from this hopelessly inadequate fragment, we strive to comprehend the whole. Our difficulty in trying to understand the Monad is the same in kind, but much greater in degree, as that which we found when we tried really to grasp the idea of the ego. [6:52:53 PM] Thuan Thi Do: Diagram XXXIX is an attempt, however inadequate, to represent graphically the relationship between the Monad, the ego and the personality. 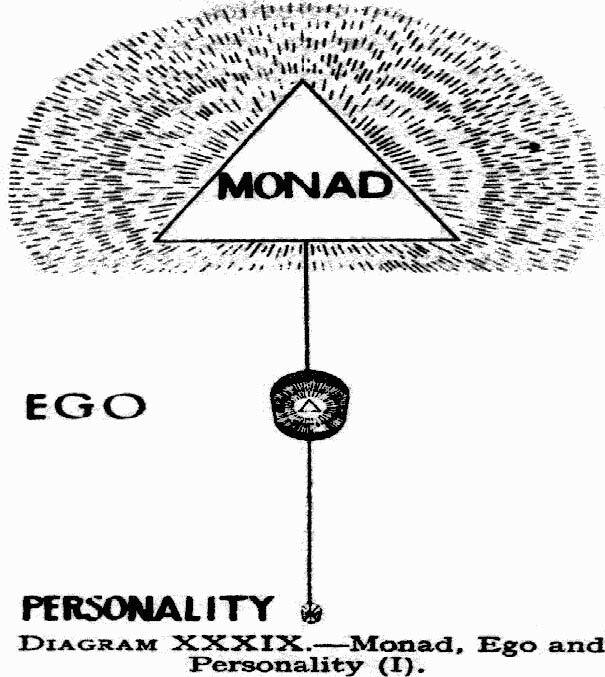 The Monad has been compared with the flame : ( Page 298 ) the ego or triple spirit with the fire : and the personality with the fuel. The correspondence between the Monad in its relation to the ego, and the ego in its relation to personality, will bear a little further amplification. 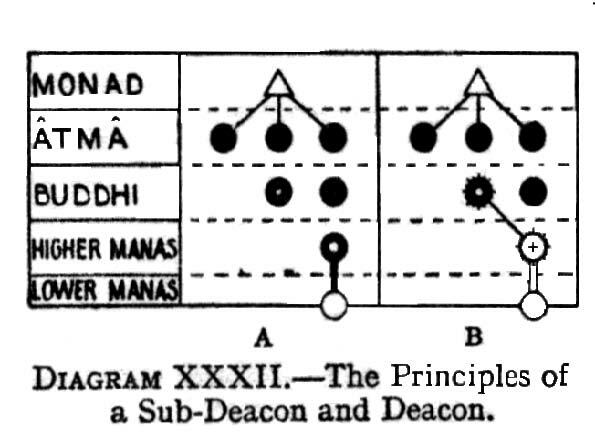 As the ego is triple, so is the Monad : the three constituents of the Monad exist on the first three planes of our System,viz., the Adi, the Anupadaka and the Âtma planes. 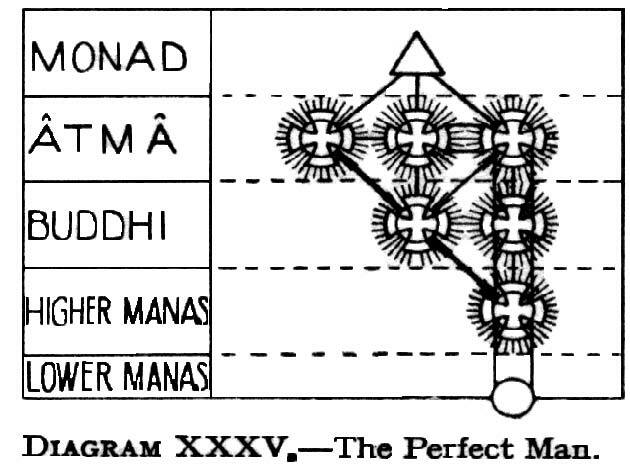 On the atmic plane the Monad takes to itself a manifestation, which we call the Monad in its atmic vesture, or sometimes the tripleÂtma, or triple spirit. This is for the Monad what the causal body is for the ego. the triple Âtma or spirit—takes on three lower manifestations [ Âtma, buddhi manas ] the first of which is on the lower part of his own plane, and the lowest two planes below that. It will thus be seen that the causal body is to the Monad what the physical body is to the ego. If we think of the ego as the soul of the physical body, we may consider the Monad as the soul of the ego in turn. For, just as the causal body takes, from the personality, whatever is of a nature to help its growth, ( Page 299 ) so the causal body, through its inner or upper side, passes on, into the third aspect ofÂtma, the essence of all experiences which may have entered into it. What is thus poured into themânasic aspect of Âtma renders it capable of acting without the causal body, that is, without a permanent vehicle which limits it. This throws light on the phenomenon of the perishing of the causal body, or individuality, with which we have already dealt in Chapter XXXI. Vol. 1, Page 150 THE SECRET DOCTRINE. [[Footnote continued from previous page]] forward by Kant and Laplace, was chiefly based on the above fact that all the planets revolved in the same direction. It is on this fact, mathematically demonstrated during the time of Laplace, that this great astronomer, calculating on the theory of probabilities, offered to bet three milliards to one that the next planet discovered would have in its system the same peculiarity of motion Eastward. The immutable laws of scientific mathematics got “worsted by further experiments and observations,” it was said. This idea of Laplace’s mistake prevails generally to this day; but some astronomers have finally succeeded in demonstrating (?) that the mistake had been in accepting Laplace’s assertion for a mistake; and steps to correct it without attracting general attention to the bevue are now being taken. Many such unpleasant surprises are in store for hypotheses of even a purely physical character. What further disillusions, then, may there not be in questions of a transcendental, Occult Nature? At any rate, Occultism teaches that the so-called “reverse rotation” is a fact. * The Occultists, having most perfect faith in their own exact records, astronomical and mathematical, calculate the age of Humanity, and assert that the latter (as separate sexes) has existed in this Round just 18,618,727 years, as the Brahmanical teachings and even some Hindu calendars declare. Vol. 1, Page 151 NATURE CAN NEVER CEASE. With these verses — the 4th Sloka of Stanza VI. — ends that portion of the Stanzas which relates to the Universal Cosmogony after the last Mahapralaya or Universal destruction, which, when it comes, sweeps out of Space every differentiated thing, Gods as atoms, like so many dry leaves. From this verse onwards, the Stanzas are concerned only with our Solar System in general, with the planetary chains therein, inferentially, and with the history of our globe (the 4th and its chain) especially. All the Stanzas and verses which follow in this Book I. refer only to the evolution of, and on, our Earth. With regard to the latter, a strange tenet — strange from the modern scientific stand-point only, of course — is held, which ought to be made known. Vol. 1, Page 152 THE SECRET DOCTRINE. most accurate of all such works) has not touched. On the other hand, even he has introduced several mistaken notions which must now be presented in their true mystic light, as far as the present writer is capable of doing so. Let us then make a short break between the Slokas just explained and those which follow, for the Cosmic periods which separate them are of immense duration. This will afford us ample time to take a bird’s-eye view of some points pertaining to the Secret Doctrine, which have been presented to the public under a more or less uncertain and sometimes mistaken light. CONCERNING PLANETS, ROUNDS, AND MAN. * See the note which follows the Commentary on the preceding page, and also the summary of the Stanzas in the Proem, page 22. † Many more planets are enumerated in the Secret Books than in modern astronomical works. Vol. 1, Page 153 DESCENDING AND RE-ASCENDING STATES. * As we are proceeding here from Universals to Particulars, instead of using the inductive or Aristotelean method, the numbers are reversed. Spirit is enumerated the first instead of seventh, as is usually done, but, in truth, ought not to be done. † Or as usually named after the manner of Esoteric Buddhism and others: 1, Atma; 2, Buddhi (or Spiritual Soul); 3, Manas (Human Soul); 4, Kama Rupa (Vehicle of Desires and Passions); 5, Linga Sarira; 6, Prana; 7, Sthula Sarira. Vol. 1, Page 154 THE SECRET DOCTRINE. [7:52:08 PM] Thuan Thi Do: But this only shows how admirably the occult philosophy fits everything in Nature, and how much more logical are its tenets than the lifeless hypothetical speculations of physical science. * Says the author of “Modern Science and Modern Thought,” Mr. Samuel Laing: “The astronomical conclusions are theories based on data so uncertain, that while in some cases they give results incredibly short, like that of 15 millions of years for the whole past process of formation of the solar system, in others they give results almost incredibly long, as in that which supposes the moon to have been thrown off when the Earth was rotating in three hours, while the utmost actual retardation obtained from observation would require 600 millions of years to make it rotate in twenty-three hours instead of twenty-four” (p. 48). And if physicists persist, why should the chronology of the Hindus be laughed at as exaggerated? Vol. 1, Page 155 EXCHANGE OF LIFE-PRINCIPLES. “Nights” — i.e., periods of activity or life, and of inertia or death — and behave in heaven as do men on Earth: they generate their likes, get old, and become personally extinct, their spiritual principles only living in their progeny as a survival of themselves. [8:11:54 PM] Thuan Thi Do: Let us then make a short break between the Slokas just explained and those which follow, for the Cosmic periods which separate them are of immense duration. This will afford us ample time to take a bird’s-eye view of some points pertaining to the Secret Doctrine, which have been presented to the public under a more or less uncertain and sometimes mistaken light. [9:51:20 PM] Thuan Thi Do: 7. Hieán daâng vôùi loøng tri aân daønh cho Helena Petrovna Blavatsky. Vị Đại Đệ Tử Đã Thắp Sáng Ngọn Đuốc Của Bà Ở Đông Phương và Mang Ánh Sáng Đến Âu Châu và Mỹ Châu năm 1875. [10:13:44 PM] Thuan Thi Do: đề các cội nguồn thế giới và cho dữ liệu đã được tích luỹ về bản chất của con người. Điều hay nhất mà con người có thể đưa ra như là một giải đáp cho vấn đề thế giới, tất yếu phải khoác lấy một hình thức kép và sẽ minh chứng qua một cách sống phụng sự tích cực, có khuynh hướng việc cải thiện các điều kiện chung quanh và qua một trình bày về một hệ thống vũ trụ nào đó hay kế hoạch vốn sẽ tìm cách giải thích càng nhiều càng hay về các tình trạng như chúng được thấy hiện hữu. Luận cứ mà con người đưa ra hiện nay đến từ nền tảng của các nguyên nhân được biết rõ và đã được chứng minh, và bỏ lại các nguyên nhân không được biết đến hoặc chưa giải thích được, vì các nguyên nhân ăn sâu này phải được coi như là đang tạo ra các nguyên nhân đã thấy và biết, mọi giải đáp mà cho đến nay vẫn thất bại và sẽ tiếp tục thất bại trong mục tiêu của chúng.